Earlier this week, North Korea launched another failed missile test. Of course that didn’t stop us from taking on one of the most unique experiences in the world: A visit to the border with North Korea. The border between South and North Korea is considered one of the most-heavily patrolled borders in the world. 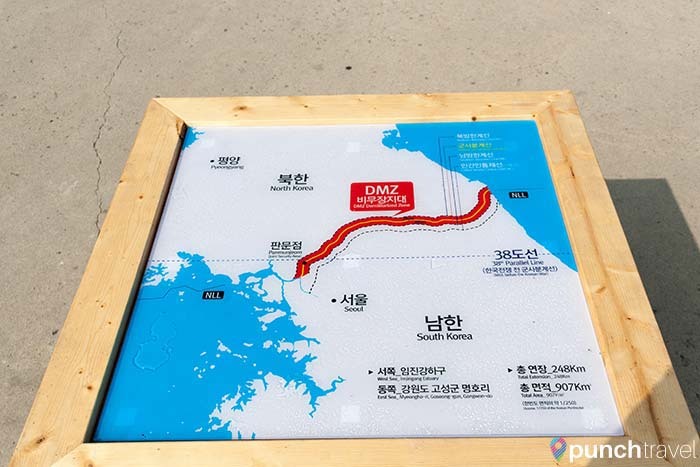 The border is within the area known as the DMZ (Demilitarized Zone) along the 38th parallel. It was established on July 27, 1953 when the Armistice Agreement was signed during the Korean War. On either side of the truce line is a 2 kilometer wide area where military activity is forbidden. 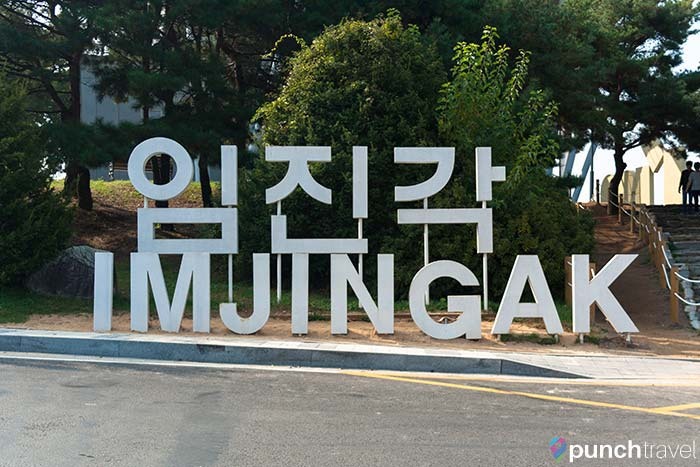 About 41 kilometers from Seoul, the nearest DMZ visitor area is Imjingak, a park in the city of Paju. 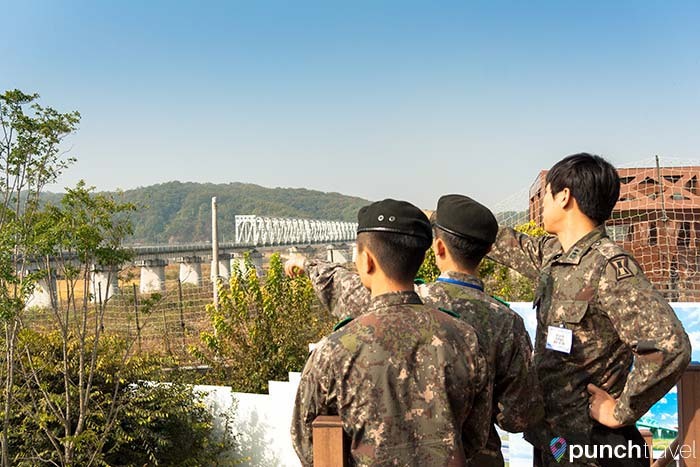 In 2014, South Korea’s national railroad operator, Korail, opened a special tourism train to the DMZ. 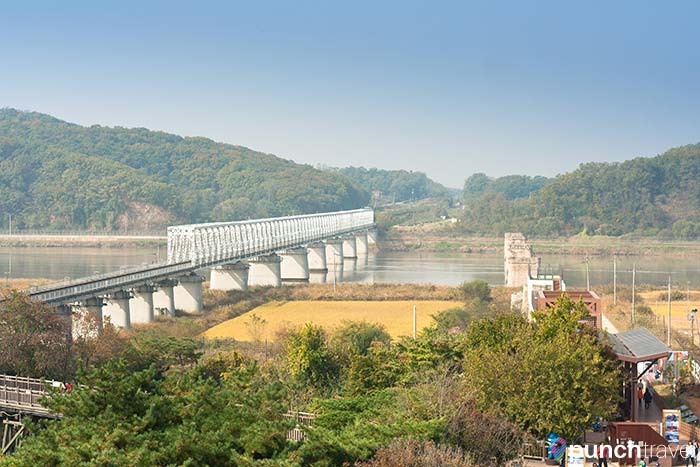 The DMZ train operates two routes from Seoul: the Gyeongui Line to Dorasan Station and the Gyeongwon Line to Baengmagoji Station. One-way fare for the Gyeongui line is 9,400 won for adults. One-way fare for the Gyeongwon Line is 12,800 won for adults. A limited number of trains operate each day. 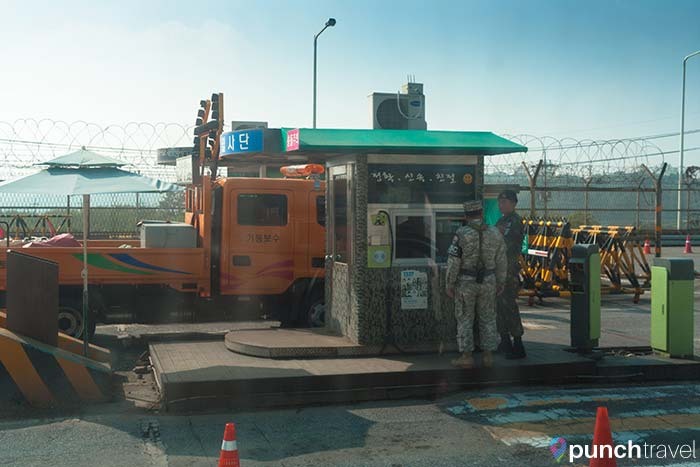 We were all set to take the DMZ train, but when we arrived at Seoul Station we learned that Korail was on strike. 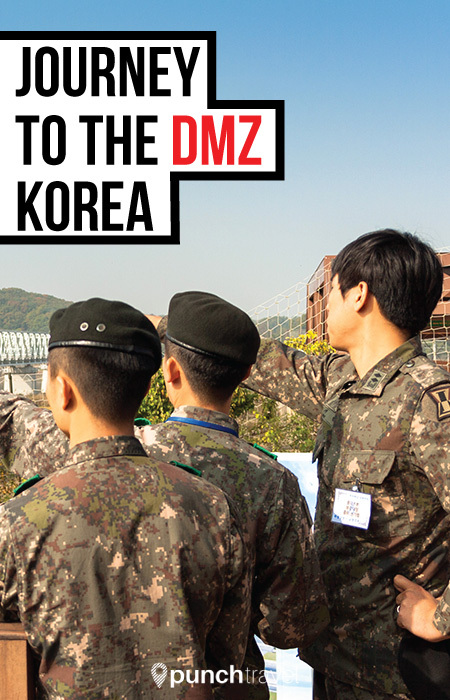 Luckily there are other ways to get to the DMZ without taking the DMZ train or joining a tour group. 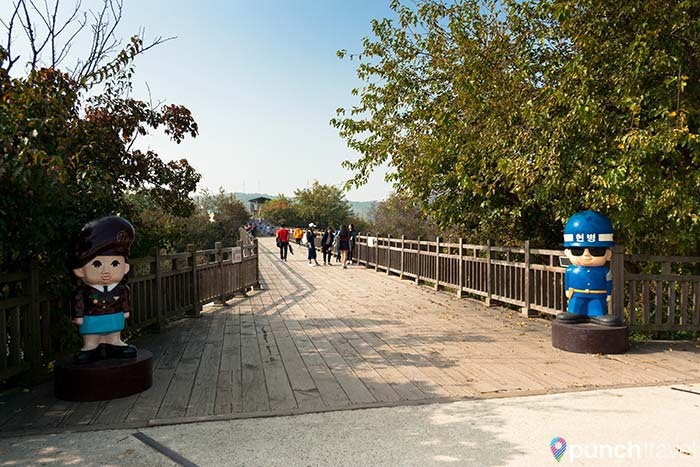 Although the DMZ train goes all the way to Dorasan Station, the closest you can get by public transportation is Imjingak Park, a few kilometers south of the DMZ. 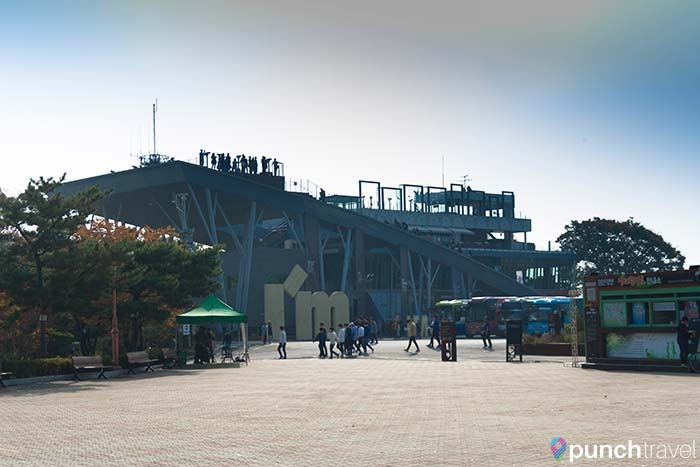 Imjingak Park has several DMZ attractions and is usually included in all tour bus stops. From Seoul, we first took the Gyeongui Jungang line to the last station, Munsan. The ride took a little over an hour from Seoul Station and costs ₩2250. At Munsan, we exited the station by following signs for the Munsan Bus Terminal, in search of bus 058. After running around for a bit, we found the bus stop, about one block in front of the station. 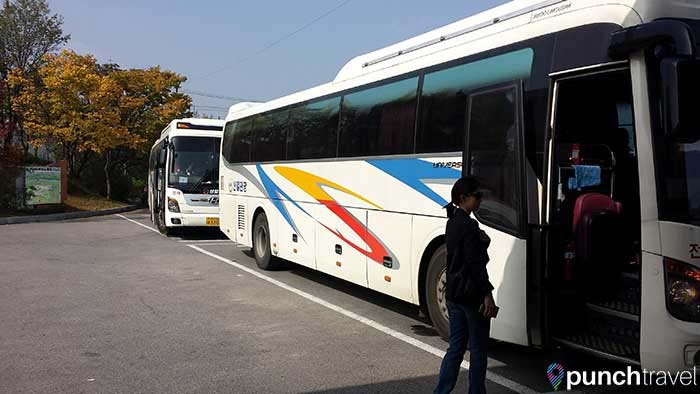 Bus 058 for Imjingak Park arrived within 10 minutes. The ride took about 30 minutes and is the last stop on the bus. Bus fare is 1,200 won and can be paid with a T-Money or Cashbee card. 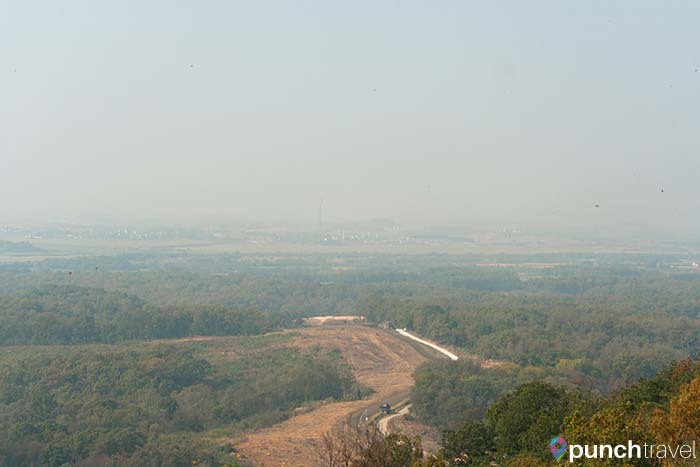 Arriving at Imjingak, just south of the DMZ, the landscape is barren except for the memorials and relics of the war. A children’s theme park is somewhat incongruously located here as well. 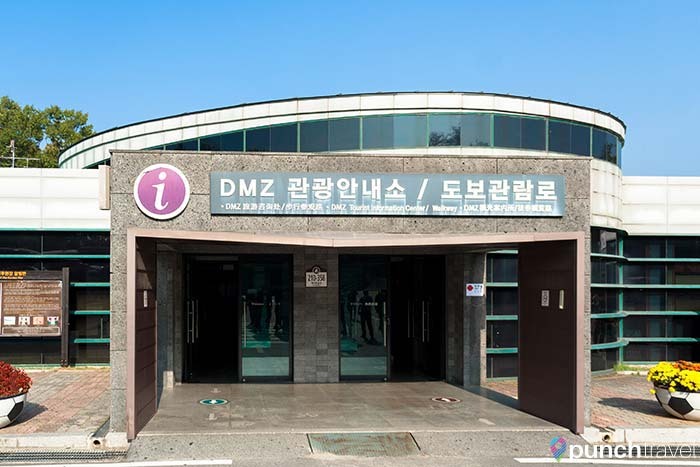 We immediately went to the tour information office in the parking lot to find out how to visit the DMZ. To get to Dorasan, you must join an organized tour. 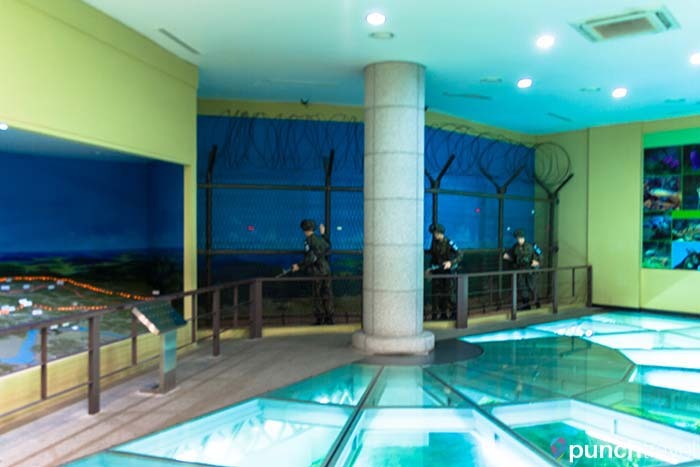 The tour includes 4 stops: Dorasan Station, Dora Observatory, the Third Tunnel, and Tongilchon Village and Museum. The tour takes 3 hours and includes transportation and entrance to each of the locations. Tours depart hourly. The time and price of the tour depends on whether you want to take a tram shuttle at the Third Tunnel. The adult ticket price is ₩9,200 on foot or ₩12,200 with a shuttle. My recommendation is that if you are old, or have trouble walking or breathing, take the shuttle. Otherwise, the walk in the tunnel is not so bad. 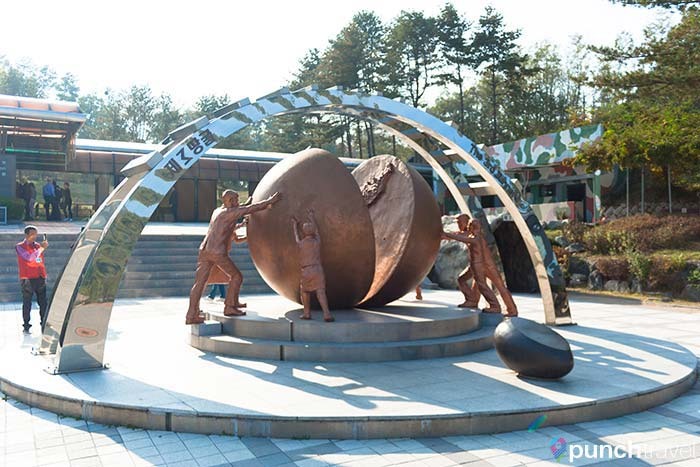 Imjingak Park was built to console refugees who left North Korea during the Korean War. 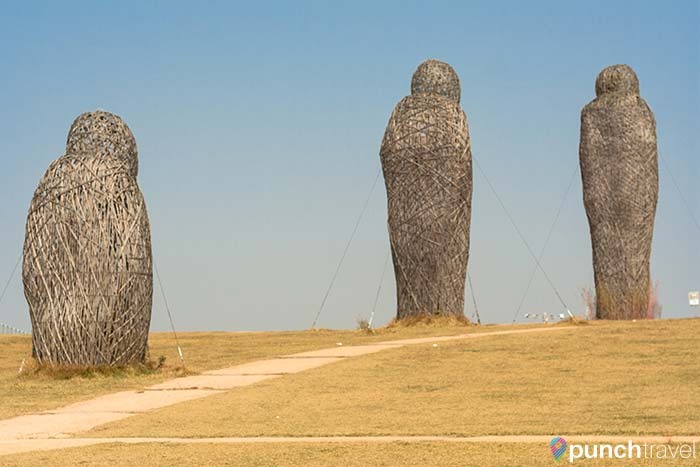 It is situated at the edge of the Imjingang River. Across the river, the view is desolate and remote. Behind the hills is Dorasan station and beyond that, North Korea. A temple at the edge of the park contains a large Peace Bell. 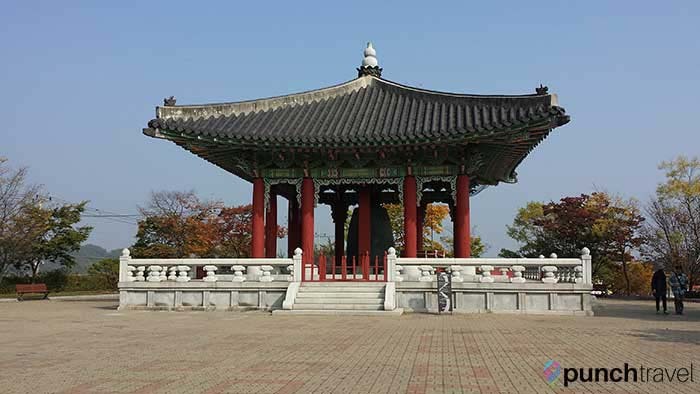 For 10,000 won, visitors can ring the bell to send a message of peace. Next to the temple is a work of art that contains rocks taken from different places of war. The boulders come from all over the world, symbolizing the tragedy that has existed around us throughout time. The Bridge of Freedom was built to free 12,373 prisoners of war when the Korean War ceased. 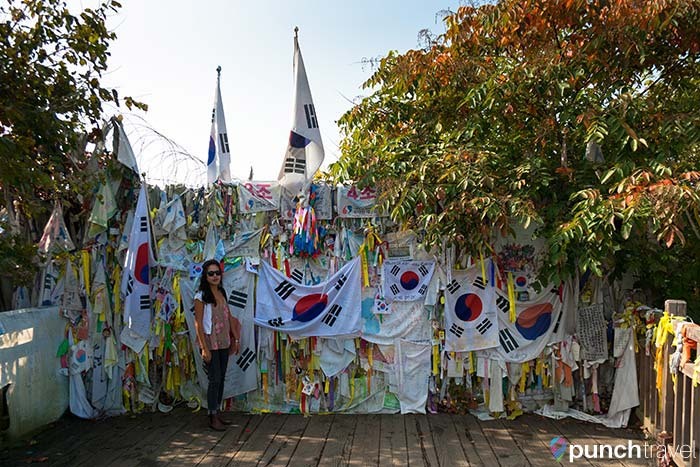 Only a small portion of the bridge remains, and the end is covered with South Korean flags and messages for unification. Traces of train tracks represent the former route that connected the North and the South. 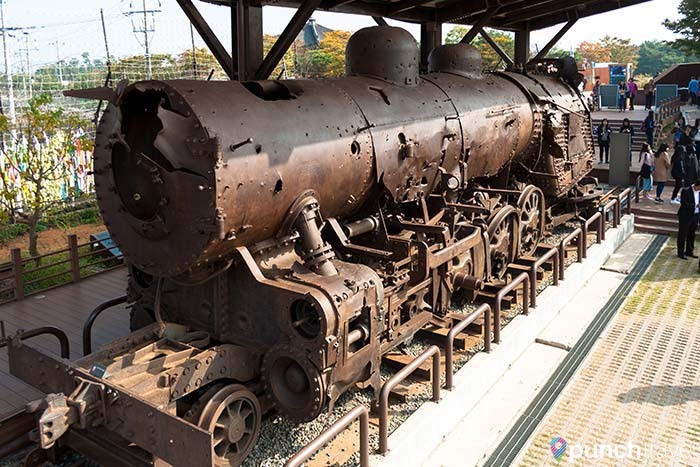 A steam engine riddled with bullet holes and explosions from when it was derailed by bombs during the war stands still. 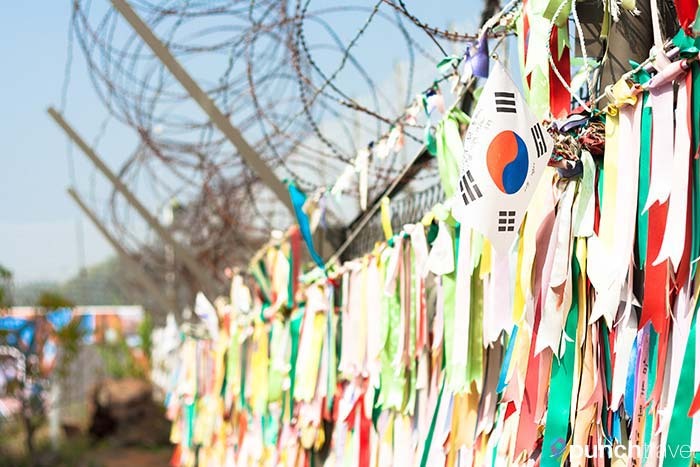 Along the barbed wire fence, visitors have tied ribbons with messages of peace and unification. At the top of the visitors center, we looked out across the river towards North Korea. It was surreal to think that just beyond the hills was a place where people suffer in possibly the most closed and repressive country on earth. 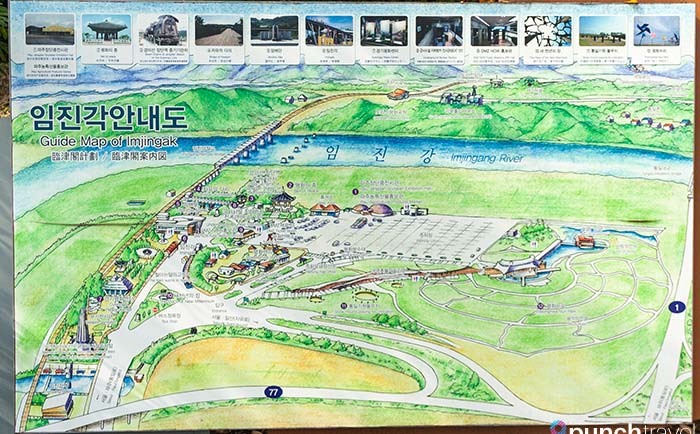 The visitors center has a few souvenir shops and restaurants, including a traditional Korean restaurant, a coffee shop, a convenience store, and randomly, a Popeye’s Chicken. We tried to eat at the Korean restaurant but they wouldn’t serve the bibimbap dish to us since we were not part of a tour group. However around the parking lot are a few other dining options. We found our bibimbap at a casual Korean restaurant which served a lot of different Korean dishes. 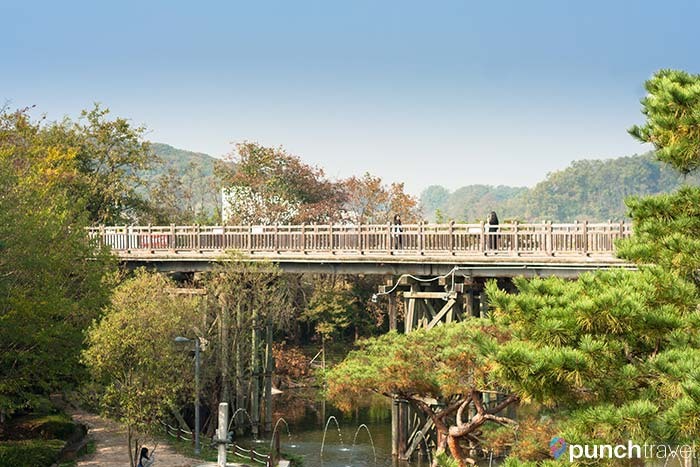 We still had a little bit of time to kill before our tour, so we walked around the park, called Pyeonghwa Nuri. The park is on a large grass hill and consists of a large outdoor theater, cafe and art installations. 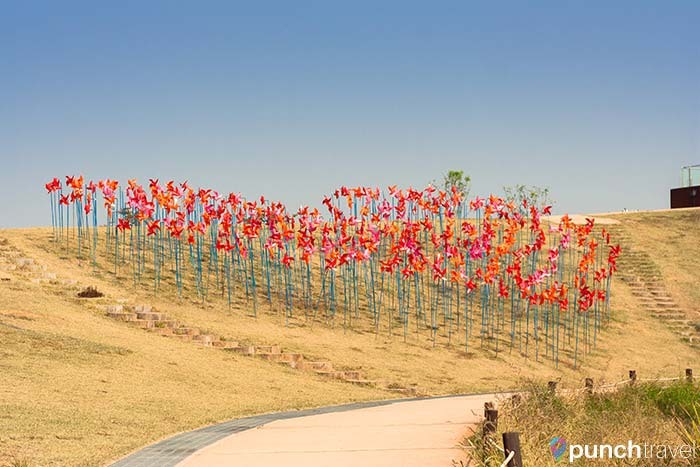 “The Hill of Wind” contains 3,000 colorful pinwheels including this arrangement. This large sculpture made from dried bamboo that reminded me of Studio Ghibli characters. Then it was time for the tour. We returned to the ticket booth where the shuttle bus was waiting. On the bus, the driver made some announcements in Korean. There were other English tour groups with us so we were able to eavesdrop on the explanations. 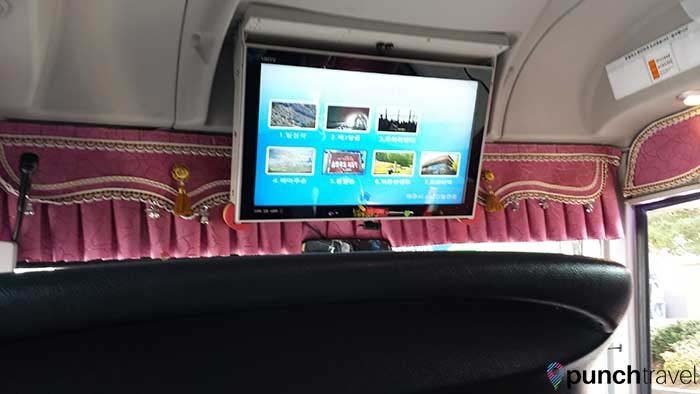 During the ride, a short video introduced each stop on the tour. Shortly after exiting Imjingak Park, we reached the first security checkpoint. This marks the southern border of the DMZ. 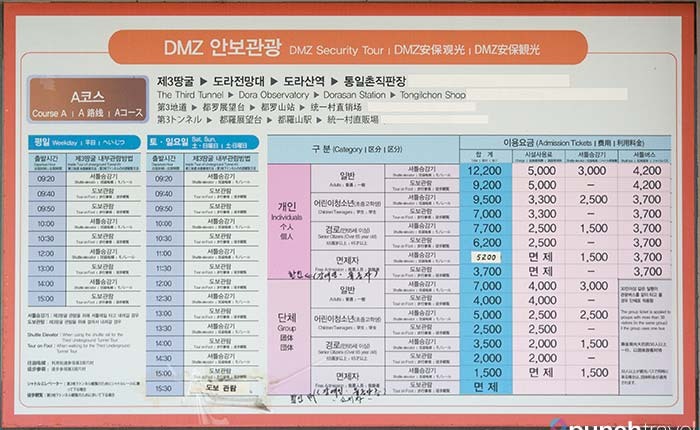 We were now entering the DMZ. US and South Korean soldiers checked each vehicle that passed through, including our tour bus. A soldier entered and walked down the aisle, checking each passenger’s passport. The stop took about 5 minutes and we were on our way. 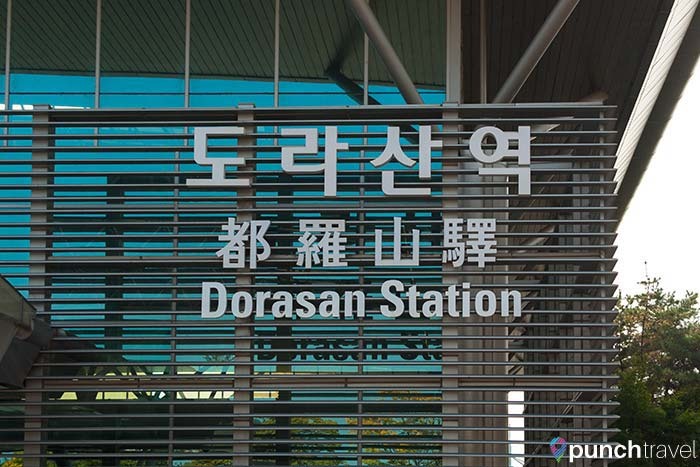 Dorasan Station is the northernmost station on South Korea’s railroad system. 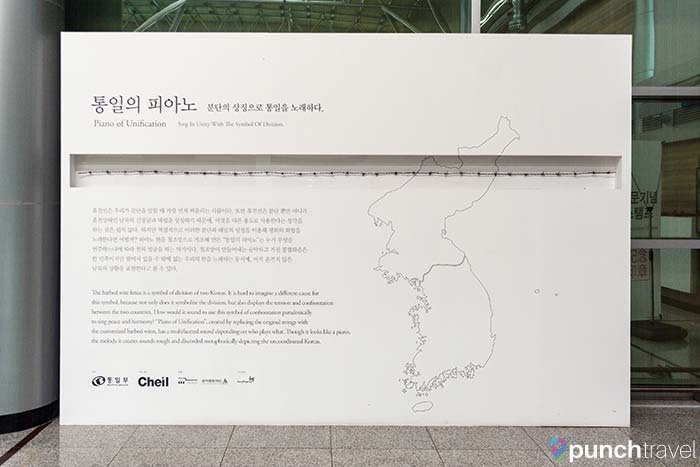 The station was built to connect with China, Siberia and Europe, but in the absence of the completion of the Gyeongui Line connecting the North and South, it seemed to only serve as a reminder of the painful division. With not even the DMZ tourist train running, the station was empty except for a few art installations and a railway track signed by former President George W. Bush. But aside from those pieces, the rest of the station seemed lost. Like it was all dressed up with nowhere to go. The second stop was Dora Observatory, built in 1986. It is the northernmost observatory in the South where you can have a clear view of North Korea. Unfortunately, the weather was not in our favor. A fuzzy haze had followed us from Seoul so the view wasn’t the best. However, we could see into North Korea with the aid of binoculars (₩500). I could see a North Korean flag waving from a very tall flagpole within a propaganda village. On a clear day you can even see a statue of Kim Il Sung erected in the distance. A line about 10 feet away from the edge of the wall where the binoculars are, delineates where you can take photos from. The risk of taking photos near the edge is that North Korean snipers may think you are holding up a weapon and shoot you. One of the most alarming things about being so close to North Korea was that we could actually hear the propaganda speech and music blasting from loudspeakers from the North Korean side. Also for some reason there were a ton of bugs. One of them ended up in my hair and joined me to the next stop! The 3rd Tunnel is one of four tunnels discovered that North Korea dug under the DMZ in an attempt to infiltrate South Korea. 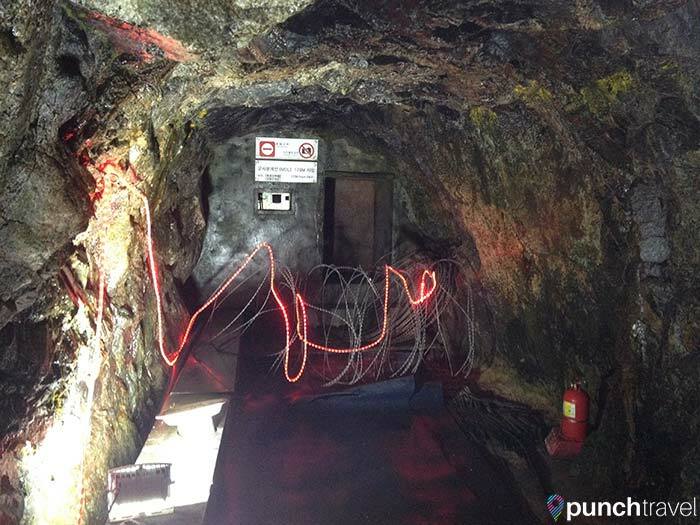 The 3rd Tunnel was discovered by the Korean army in 1978 and is only 52 kilometers from Seoul. It is 2 meters wide, 2 meters high and 1,635 meters long. It is large enough for an army of 30,000 soldiers to pass through in an hour. Before entering the tunnel, we had to leave our backpacks and electronics in lockers (for free) and then pass through a security scanner. Hard hats are also required, and you’ll need it. 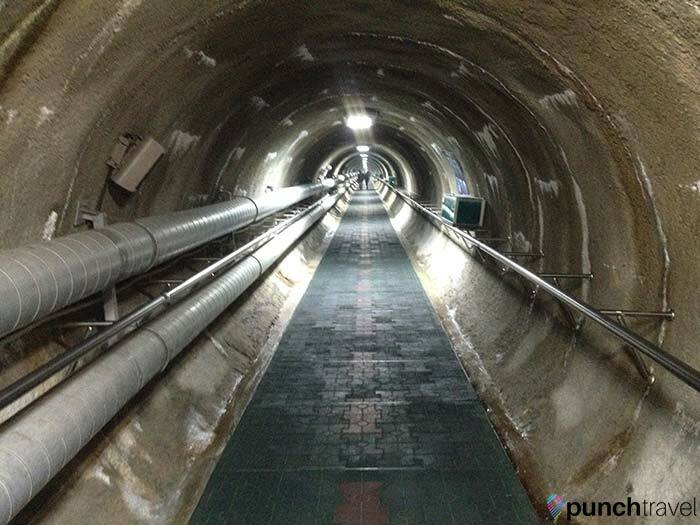 The first 300 meters or so through the interception tunnel is wide and easy to walk through. At a junction point we crossed the arrival point of the tram and then entered the North Korean infiltration tunnel. This tunnel is at a depth of 73 meters. It is much more rudimentary, with narrow walkways, low ceilings (here’s where the hard hat comes in) and dripping water. 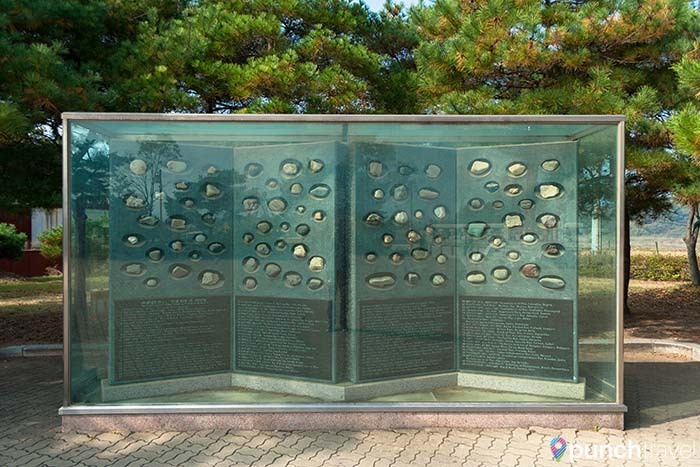 Throughout the tunnel are traces of holes where dynamite was to be placed, aimed at South Korea. At the end of the tunnel is the first of three barriers that block access to the actual military demarcation line. Photographs are not permitted in the tunnel. Don’t ask me how I got these. Also at the 3rd Tunnel site is a small museum and more art installations. Tongilchon Unification Village is a small neighborhood in the northern part of the Civilian Control Line. It was created in 1973 and its residents include heads of families who had been discharged from military service. We visited a small museum which provided an overview of the town and the local agriculture. The primary industry here is farming, and Tongilchon is known for its Jangdan bean curd, rice and ginseng. 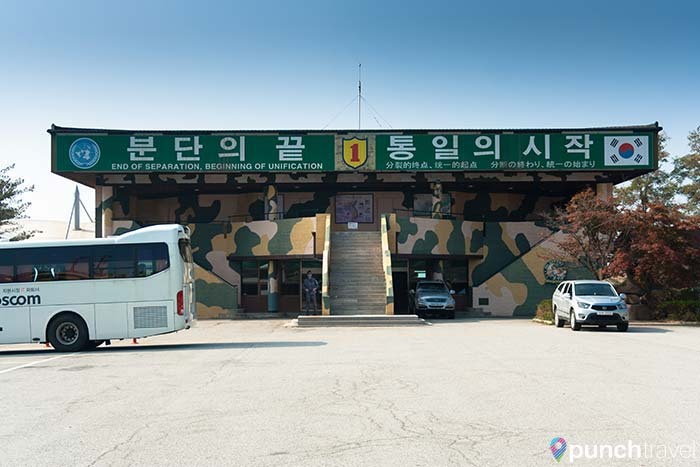 This was also the souvenir stop and a variety of the local products are for sale, including wine from North Korea, North Korean currency as well as DMZ branded hats, t-shirts and other memorabilia. That was the last stop on our three hour tour and we headed back towards Imjingak Park. It’s important to remember that technically North Korea and South Korea are still at war. The Armistice Agreement of 1953 only called for a ceasefire. If you follow the news, it’s clear that North Korea is keen to push the limits of that agreement. Our visit to the DMZ was a unique experience that only scratched the surface of what life must be like for those affected by the Korean war. In one day, we were able to feel the tension between the North and South and understand the desire of Koreans to reunite the country again. Stay tuned for part 2 of our journey to North Korea, where we visit Panmunjom and the JSA. 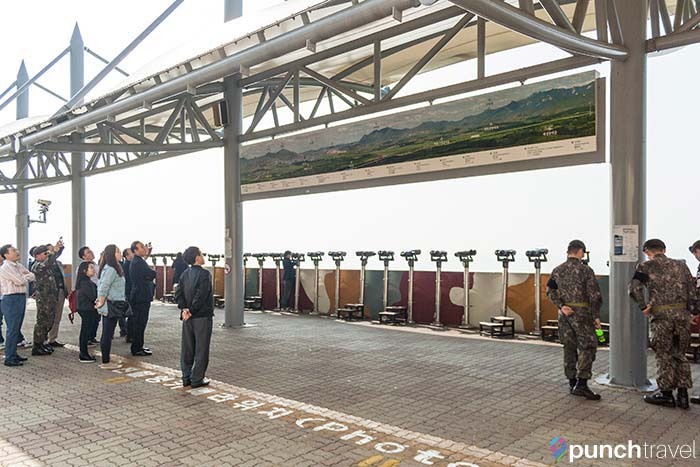 Hmmm, Photo Line at Dora Observatory … our tour groups ignored and ROK soldiers looked on. It’s in my pictures, but no one make a fuss about it. Also the access tunnel to tunnel # 3 is REALLY STEEP ! Hard to walk down, and up. Long. Did you not make it to the JSA ? That was a weird experience !